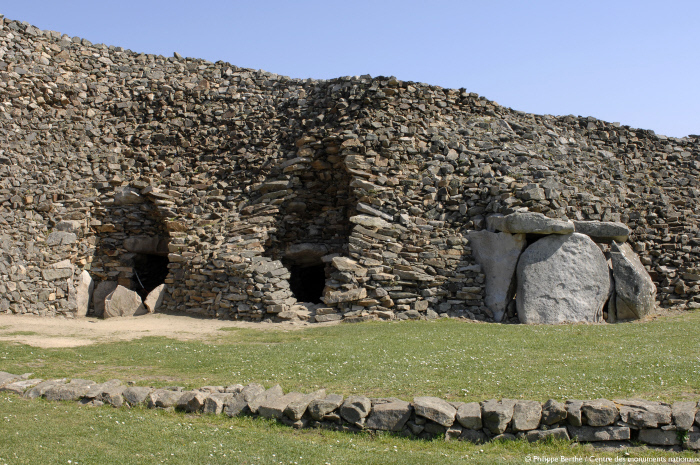 The Cairn of Barnenez is situated on the Kernéléhen peninsula, in northern Finistère (Brittany). It is one of Europe’s oldest examples of a construction made from durable materials. This vast megalith dates back to the Neolithic period, which saw the emergence of polished stone, livestock farming and agriculture. This curious, ancient construction stands at the top of a hill on the coast of the English Channel. It is notable for its elongated appearance and for its age, dating back to around 4500-3500 B.C. The monument is particularly striking in terms of its size, measuring 72 metres long, approximately 20-25 metres wide (variable width) and 9 metres tall. In total, it features 6,500 to 7,000 m³ of stone and weighs between 12,000 and 14,000 metric tonnes. In fact, the site consists of two juxtaposed cairns, saved from destruction at the very last minute in 1955. The stones are decorated with idol crests, V-shaped engravings and dotted axes. Other finds at the monument have included numerous pieces of flint, shards of pottery and polished axes.